For this month’s Arabic Flavor assignment, our host Ihssan chose Moroccan Harira soup. This rich soup has been on my list of recipes to try forever and a day. It is one of the most popular recipes in the Moroccan cuisine. A cuisine that I have always been fascinated by. The colors, the spices, the layers of flavor, the level of art that goes into pastries, desserts and candy In the Moroccan and the whole North-West Afrian cuisine is mesmerizing to say the least. Harira if you’re not familiar with it is a tomato and legumes soup. It’s fragrantly seasoned with caraway, pepper, and a robust quantity of fresh aromatic herbs and veggies: cilantro, parsley, celery and onion. Dilute 3 tablespoons of all-purpose flour in some water. Mix very well until all the flour is dissolved.Add the flour mixture to the soup, while stirring continuously, until the soup thickens. You many not need to use all the flour mixture, so add it little by little. Cook the soup for 2-3 minutes. شوربة مغربية معروفة بامتياز،واكيد اغلبكم سمع بها، وهي شوربة الحريرة المغربية. Posted in Arabic and middle eastern recipes, arabic flavor, Soup and tagged #arabic_flavor, #moroccan_harira_soup, arabic recipes, comfort food, moroccan harira, soup. Bookmark the permalink. Harira is so good with dates! I take a sip of soup and then eat a piece of date mmmmm. Sounds wonderful. Must try it one of these days. It would be an ultimate cold weather buster. I only follow two food blogs, yours and http://www.thewednesdaychef.com/. How amazing that on the same day you both posted the same recipe, Harira Soup. I have to make it today! Love your blog, I am discovering so many new recipes and flavours. This sounds really good and not too difficult for someone who doesn’t have a lot of ‘spoons’ for cooking. Not sure about the celery, but willing to try. Going to make this next week maybe. The soup and ingredient list reminds me of mulligatawny soup, its ingredient list is a mile long but it’s so delicious it’s worth the time and effort to make it. 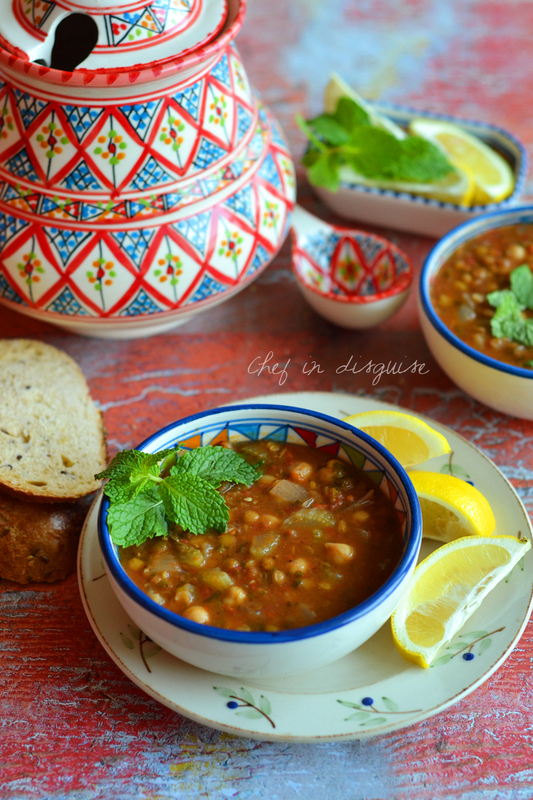 I didn’t get a chance to try harira soup when we were in Morocco which makes me want to make your recipe very soon. We’ve had a bit of a reprieve from the cold weather and it’s going to be 20C tomorrow, but it’ll cool down on the weekend, perfect timing for soup. We’re definitely moving into soup season Sawsan and this looks great! I love the idea of freezing some soup as well. That will make for an easy meal on a weeknight. Your pictures are amazing….looks so delicious and healthy! This looks and sounds so inviting Sawsan! YUM!